The president and executive director of the National Biodiesel Foundation gave an update on the organization’s activities during the second general session of the 2016 National Biodiesel Conference. 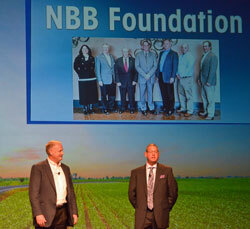 NBF Executive Director Tom Verry says the priorities for the foundation are sustainability, infrastructure, education and research. “In the past couple of years, sustainability work in California has been a major focus for the foundation,” said Verry, noting that the foundation helped fund research to help the state get a more accurate assessment of biodiesel’s carbon reduction benefits, adding millions of dollars to the value of biodiesel in California’s carbon credit market. In the education arena, foundation president Mike Cunningham of the American Soybean Association highlighted a $10,000 donation made last year by HERO BX. “With these funds we held a biodiesel workshop for auto technicians at Erie County Technical School in Erie, Pennsylvania,” he said. Other educational activities planned for this year include a Congressional staffer tour to showcase bioheat in New York City. The foundation started a memorial fund to honor industry champion Dallas Hanks, who passed away in 2014. “We have raised close to $10,000 to pay for scholarships for students to attend this conference,” said Cunningham. The Foundation holds a fundraising auction at the annual conference but anyone can donate anytime by going to the website – biodieselfoundation.org. You can also follow them on Twitter – @Biodiesel_Fnd.